The C-FARE report on Big Ag. Data examines Big Ag. Data's potential, challenges and opportunities, as well as future research questions and approaches for extension and outreach. See the executive summary of the paper here. View the full report here. The report was released by a multidisciplinary team of economic and engineering scientists. Authors Keith Coble (Mississippi State University, Department of Agricultural Economics) and Terry Griffin (Kansas State University, Department of Agricultural Economics) released the document at the USDA National Institute of Food and Agriculture (NIFA) Data Science in Agriculture Summit (see @USDA_NIFA #NifaAg.Data). Report co-authors include: Mary Ahearn (retired USDA-ERS), Shannon Ferrell (Oklahoma State University, Department of Agricultural Economics), Jonathan McFadden (USDA-Economic Research Service), Steve Sonka (University of Illinois at Urbana-Champaign, Department of Agricultural and Consumer Economics), and John Fulton (The Ohio State University, Department of Food Agricultural and Biological Engineering). 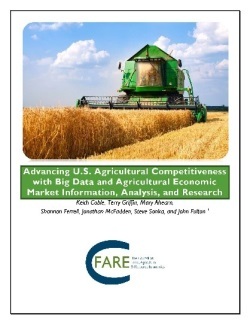 C-FARE and the USDA Economists Group will co-host a webinar on the topic on November 18th at 12 PM – 1 PM ET. You may attend the webinar online or a seminar in-person (email: cgala@cfare.org). Please register for the webinar here: https://attendee.gotowebinar.com/register/1735623463284370180. The workshop provided an opportunity for participants to engage in broad discussion about the development of the bio-economy. The workshop discussed progressing the United States towards efficient use of renewable aquatic and terrestrial biomass resources. To read more about the event and a list of the speakers click here. Please see our YouTube channel to listen to the presentations. The Montana State University Department of Agricultural Economics and Economics and MSU Extension will host an agricultural economics conference, “Agricultural Production Trends and Changing Food Systems,” on Nov. 11. The Department of Agricultural Economics and Economics is a joint department of the MSU College of Agriculture and MSU College of Letters and Science. At the conference, MSU agricultural economics and Extension faculty will speak about topics tailored to the Montana agricultural industry, including grain and cattle markets, banking regulation, crop viruses, farm bill updates, Montana poverty statistics and agricultural profitability under the statewide agricultural production research grant with the Montana Research and Economic Development Initiative. Read more here. "The European Union’s antitrust watchdog will launch an in-depth probe into China National Chemical Corp.’s plan to buy Syngenta AG to determine if the deal would lower competition for crop-protection products. The investigation will focus on whether combining Swiss-based Syngenta, which sells about one-fifth of the world’s pesticides, with a ChemChina-owned company that supplies generic alternatives would leave farmers with higher chemical costs or fewer available products, according to the EU. The move was expected after Syngenta signaled earlier this week that its sale would likely be delayed until early 2017. It reflects the level of scrutiny by antitrust authorities for farm-sector deals at a time when farmers in Europe and the U.S. grapple with low grain prices following consecutive bumper crops that swelled global supplies...“We need to carefully assess whether the proposed merger would lead to higher prices or a reduced choice for farmers,” said EU Antitrust Chief Margrethe Vestager.. Read more here. By a vote of 586 to 19, the European Parliament has passed a Resolution which calls on the EU to "place mandatory limits on industrially-produced TFA [as it] may increase the risk of cardiovascular disease, infertility, Alzheimer’s, diabetes and obesity for consumers ... Members of the European Parliament (MEPs) mention the fact that”, only one in three consumers in the EU knows about TFAs which shows that labelling measures are not enough. Read more here. October 18, 2016 - NIFA Introduces New Vision for Data Science in Agriculture. The U.S. Department of Agriculture’s National Institute of Food and Agriculture (NIFA) convened a summit to identify the frontiers and future of data in agriculture and build on existing U.S. government-wide efforts and investments in big data. NIFA Director Sonny Ramaswamy announced a new initiative, Food and Agriculture Cyberinformatics and Tools (FACT), designed to develop data-driven solutions for addressing complex problems facing agriculture, in his welcome address. The FACT initiative recognizes that analyses of agricultural systems to identify novel solutions require multi-scale data, machine learning, data visualization, and predictive modeling. WORKSHOP:NIFA encourages communities to develop workshop proposals that address these topics in further detail to identify needs and develop strategic plans. These workshops can focus on needs for generating, managing, and integrating big data in a specific domain of the food and agricultural system. NIFA routinely considers workshop proposals in the Foundational Program of the Agriculture and Food Research Initiative. Read more here. Oct 14,2016 - Information on Federal Agencies' Expenditures and Coordination Related to Harmful Algae. Twelve federal agencies reported expending an estimated total of roughly $101 million from fiscal years 2013 through 2015 to fund various research, monitoring, and other activities related to harmful algae-overgrowths of algae that can create toxic "blooms" in marine or freshwater environments. The agencies provided a mix of actual and estimated expenditure data and used different methods for collecting the data, making comparisons among agencies, and a federal total, inexact. Read more here. October 10, 2016 - 2016 World Food Prize Presented to Four International Researchers – Agricultural economist, Jan Low was one of the honorable recipients. Dr. Low (second from left above) is The International Potato Center’s Regional Leader for Africa, recognized the potential of orange fleshed sweet potato (OFSP) to combat Vitamin A deficiency among young children in Sub-Saharan Africa. To establish an evidence base that nutritionists could rely on, she conducted a major study among poor African communities in 2005—with support from USAID, the Micronutrient Initiative, and the Rockefeller Foundation—demonstrating that consumption of OFSP led to a 15 percent decline in Vitamin A deficiency in children who consumed a daily portion of OFSP compared to children who did not. Armed with that knowledge, she led a seminal study under a HarvestPlus “Reaching End Users” project that was concerned with how to effectively deliver OFSP to poor and vulnerable households. This study firmly established that it was possible to cost-effectively scale up using the pioneering integrated agriculture-nutrition-marketing approach. Oct 13, 2016 – U.S. Unveils New Impacts Against Global Poverty and Malnutrition and Outlines Five-year Strategy to Attack World Hunger. As leaders and experts from around the world gather in Des Moines, Iowa, for the annual World Food Prize, the U.S. Agency for International Development announced impressive progress toward achieving the goals of Feed the Future, the U.S. Government's global hunger and food security initiative. The initiative's annual progress report notes that since the start of the initiative, poverty has dropped up to 36 percent in many areas where Feed the Future works and child stunting -- a measure of malnutrition -- has dropped by as much as 40 percent. Read more here. Oct 12, 2016 – Raising soda taxes may sound good, but likely to fall flat with US consumers. The World Health Organization (WHO) has recommended governments raise taxes on sugary drinks and increase subsidies on fruits and vegetables, to fight global obesity and diabetes. David Just, marketing and economics expert and professor at Cornell University's Charles H. Dyson School of Applied Economics and Management, calls the recommendation intriguing, but says the WHO's approach is bound to get mixed results. Read more here. The Foundation for Food and Agriculture Research (FFAR) held a board meeting the week of October 3rd. During the meeting, the board officially added the following six new members : Doug Cameron, Managing Director of First Green Partners; Carl Casale, President and Chief Executive Officer of CHS Inc.; Gail Christopher, Senior Advisor and Vice President at W. K. Kellogg Foundation; Mehmood Khan, Vice Chairman and Chief Scientific Officer of Global Research and Development (R&D) at PepsiCo., Pam Marrone, Founder and CEO of Marrone Bio Innovations; Bob Stallman – Rice and Cattle producer and past President of the American Farm Bureau Federation. More information on the FFAR board members can be found here. As a part of the board meeting, a public session was held to share the latest information on the foundation’s programs and activities. FASS Washington Representative, Carong Gala participated in the session. FFAR Executive Director, Sally Rockey also unveiled FFAR’s new challenge areas which will help guide the foundation’s priorities. The seven challenges areas are: Food Waste and Loss, Protein Challenge, Water Scarcity, Innovation Pathway to Sustainability,Healthy Soils, Thriving Farms, Urban Food Systems, and “My Food Plate”. Oct 6, 2016 – How a Food Subsidy Program Pushed Junk Food Off the Table. In a review of federal food subsidy programs, researchers found that nudging shoppers toward more healthful foods pushed cheap junk food out of the family shopping basket without adding to the government’s costs. The data comes from a study of purchases by users of the Special Supplemental Nutrition Program for Women, Infants and Children, better known as WIC, before and after changes were imposed to encourage healthy eating. Read more here. Oct 6, 2016 – NIFA Honors Land-Grant University Partners, Announces New Inductees to NIFA Hall of Fame. The U.S. Department of Agriculture’s (USDA) National Institute of Food and Agriculture (NIFA) today honored several of its land-grant university partners during its annual Day of Appreciation ceremony. Those honored were recognized for supporting NIFA’s vision to catalyze transformative discoveries, education, and engagement to address agricultural challenges. Dr. Daniel Rossi, an agricultural economist at Rutgers, received one of the awards. Dr. Rossi has served as the executive director of the Northeastern Regional Association of State Agricultural Experiment Station Directors since 2007. He has also served in numerous national leadership positions within the State Agricultural Experiment Station System. Rossi completed degrees in agricultural economics at Rutgers and Pennsylvania State University. Read more here. Global food markets will likely remain "generally well balanced" in the year ahead, as prices for most internationally-traded agricultural commodities are relatively low and stable, FAO said today. The benign outlook, especially for staple grains, is poised to lower the world food import bill to a six-year low, per the Food Outlook. Record global production forecasts for this year's wheat and rice harvests, along with rebounding maize output, are helping keep inventories ample and prices low. Read more here. Oct 6, 2016 – USDA Announces Increased Support to Expand and Diversify the U.S. Agriculture Workforce. The U.S. Department of Agriculture (USDA) today announced increased federal and private-sector support to expand and diversify the U.S. agricultural workforce by increasing opportunities in education, research and outreach. The announcement is part of the White House Office of Science and Technology Policy (OSTP) and Rural Council initiative, America the Bountiful, a collaboration with federal agencies and private-sector stakeholders to meet the growing demand for a skilled, diverse workforce in the rapidly evolving agricultural landscape. Read more here. The University of North Dakota, in partnership with Iowa State University, Kansas State University and the University of Nebraska-Lincoln, is "leading a multi-institution Digital Agriculture Spoke grant of about $1 million from the National Science Foundation (NSF) [which] describes the UND-led project as follows: 'Digital Agriculture - Unmanned Aircraft Systems, Plant Sciences and Education' ... " - The Midwest Big Data Hub is intended to "help collaborators across institutions to build partnerships to address emerging issues, such as precision agriculture, ecosystem management and services, socio-economic impacts, and specific data-related issues. The grant aims to foster collaborative relationships among Midwestern agricultural and Big Data, or high-tech computing, constituencies. The project also includes national and international collaborations. Read more here. The Agricultural Development Bank of China [AGDBC.UL], one of the country's main policy lenders, agreed to loan at least 3 trillion yuan ($450 billion) by 2020 for the modernization of China's agriculture industry, state media said on Sunday. The Ministry of Agriculture and the bank, which lends in line with government policy, signed an agreement to protect national food security, support the sector doing business overseas and develop China's seed industry, per the official Xinhua news agency. Read more here. The Directorate for Social, Behavioral and Economic Sciences (SBE) offers Postdoctoral Research Fellowships to encourage independence early in the Fellow's career through supporting his or her research and training goals. The research and training plan of each fellowship must address important scientific questions within the scope of the SBE Directorate and the specific guidelines in this fellowship solicitation. The SPRF program offers two tracks: (I) Fundamental Research in the SBE Sciences (SPRF-FR) and (II) Broadening Participation in the SBE Sciences (SPRF-BP). See the full text of the solicitation for a detailed description of these tracks. Synopsis: This AFRI Challenge Area focuses on the priority to mitigate and adapt to climate variability and change. It supports activities that reduce greenhouse gas emissions, increase carbon sequestration in agricultural and forest production systems, and prepare the nation’s agriculture and forests to adapt to variable climates. The long-term outcome for this program is to reduce the use of energy, nitrogen fertilizer, and water by ten percent and increase carbon sequestration by fifteen percent through resilient agriculture and forest production systems. To achieve this outcome, this program will support multi-function Integrated Research, Education, and/or Extension Projects and Food and Agricultural Science Enhancement (FASE) Grants. The overall purpose of this RFA is to promote research that fills in gaps in the understanding of the potential impacts of OGD on human health and the environment.The U.S. Environmental Protection Agency (EPA) seeks applications for multidisciplinary research that will foster a better understanding of how the rapid increase of OGD activities in the Appalachian Basin may impact the surrounding environment and public health. Specifically, research projects are sought that can identify and quantify water quality impacts associated with OGD activities and inform related human and ecological exposures. The Organic Farming Research Foundation (OFRF) grants program is currently accepting research proposals from applicants residing in Canada, Mexico, and the United States. OFRF encourages farmers, ranchers, graduate students, early career researchers, veterans, and Extension personnel to consider applying for funding.OFRF will notify applicants about funding decisions in early spring 2017.OFRF offers funding for research on organic farming and food systems and the dissemination of these research results to organic farmers and the greater agricultural and research communities. Proposals must involve farmers or ranchers in project design and implementation and must take place on certified organic land, ideally on working organic farms or ranches. Project proposals will be reviewed and awarded by the OFRF Board of Directors, most of whom are certified organic producers. Synopsis: The goal of this program is to detect, prevent, eradicate, and/or control invasive plant species to promote resiliency, watershed stability, and biological diversity on federal, state, or private land. GLRI funding is available to Cooperative Weed Management Areas (and similar organizations, e.g., Cooperative Invasive Species Management Areas (CISMAs) and Partnerships for Regional Invasive Species Management (PRISMs), etc.,) that work within the Great Lakes Basin of Minnesota, Wisconsin, Michigan, Illinois, Indiana, Ohio, Pennsylvania, and New York. CWMAs and similar groups are organized partnerships of Federal, State, and local government agencies, tribes, individuals, and various interested groups that manage invasive species (particularly plants) within a defined area, generally a county or larger in size. Proposals may include work on all land ownerships within the Great Lakes watershed of the United States (see application instructions, appendices A and B, for maps and county listings). The OREI seeks to solve critical organic agriculture issues, priorities, or problems through the integration of research, education, and extension activities. The purpose of this program is to fund projects that will enhance the ability of producers and processors who have already adopted organic standards to grow and market high quality organic agricultural products. Priority concerns include biological, physical, and social sciences, including economics. The OREI is particularly interested in projects that emphasize research, education and outreach that assist farmers and ranchers with whole farm planning by delivering practical research-based information. Projects should plan to deliver applied production information to producers. Synopsis: The Office of Community Services (OCS) will award approximately $9.5 million in CED discretionary grant funds to CDCs for community-based efforts to improve the economic and physical health of people in areas designated as food deserts or where applicants can point to indicators of need, such as poor access to a healthy food retail outlet, a high percentage of individuals with low-income, incidence of diet-related health conditions, or high concentrations of persons eligible for food assistance programs. Through the Community Economic Development (CED) program and within the framework of the Healthy Food Financing Initiative (HFFI), OCS seeks to fund projects that implement strategies to increase healthy food access, foster self-sufficiency for individuals and families with low-income, and create sustained employment opportunities in communities with low-incomes. October 31, 2016 - Notice of Invitation for Nominations to the Advisory Committee on Agriculture Statistics - The USDA National Agricultural Statistics Service (NASS) is seeking the nomination of individuals to serve on its Advisory Committee on Agriculture Statistics which "... advises the Secretary of Agriculture on the scope, timing, content, etc., of the periodic censuses and surveys of agriculture, other related surveys, and the types of information to obtain from respondents concerning agriculture. The Committee also prepares recommendations regarding the content of agriculture reports and presents the views and needs for data of major suppliers and users of agriculture statistics ..." Applications Due By: Nominations must be received within 30 days of October 31, 2016. C-FARE and the AAEA Government Relations Committee seeks peer and self-nominations for consideration of support by November 14th, 2016. For more information on the committee, please see here. Email Caron Gala (Cgala@cfare.org) for more information.